I think we all deserve a blog post about skiing! After all, I've been working hard writing and selling real estate. I've also recently subjected you my readers to a few commercial announcements. I love to ski and write, but like any business person, I have to pay the bills so you get the occasional commercial. Just like Tee Vee. Back to the business at hand.....skiing is great in the Adirondacks. I live near Mount Van Hoevenberg, site of the 1980 Olympic Winter Games cross-country skiing, biathlon and sliding events. Although yesterday was a busy one professionally, I managed to squeeze in a good training ski-skate late in the day. 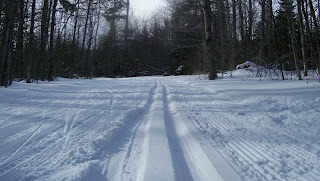 The trails are groomed to perfection for either classic or ski-skating and the downhills are nice and fast. Even though last night was the dark of the moon, I skied after dark without the use of a headlamp because the trails are so lovely, wide, and well groomed. There are number of additional commercial cross-country ski centers in the region and all are reporting excellent conditions. Backcountry skiing in the Adirondack High Peaks is good, with enough coverage, but the snow has settled so conditions are fast on well-traveled routes such as the trails starting at the Adirondack Loj. The entire Jackrabbit Trail is ski-able, with hard and fast conditions. The approach to both the Wright Peak and Marcy Ski Trails are a little boney, but there is good cover up high. The word from Whiteface Mountain is very good; in addition to the Gondola, the Face Lift is running so the upper mountain is open with packed-powder conditions on Skyward, one of the best runs at Whiteface and part of the 1980 Olympic Men's Downhill course. So many skiing choices, so little time! Enjoy.